Designers have the best jobs! And travelling has to be the very tip-top best of it. When scientists do research they are closeted in labs, possibly without windows and staring down into a microscope - OK - I don't know much about scientists, so I am probably way off - but here is what designers do for research - they go to the coolest spots in the world, from Salt Springs to Martha's Vineyard, from New York to Montreal, from out-of-the-way places to world capitals - we visit, we look we touch we sniff and smell the influences of other cultures, of other climates, of other geography. We see the crafts and the unique expression of each cool little nook, and exploit it for all of its beauty, its delicacy its atmosphere and its feminine meaning. 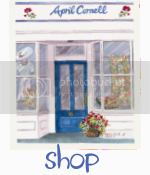 Yes - we do go shopping! And we take pictures - and we have lunch, and we sit and we watch what others are doing. We imbibe the things that make each spot unique and inbed that into out designs. Yesterday was one such lucky day. I strolled with Donna the streets of Amsterdam, the cobblestone canals, and peered over the pretty bridges. We ate Dutch pancakes and admired the houseboats and the swans, the surpirse of a blue heron, and the delight of the ducks. We visited small boutiques full of fragile antiques, up and down staircases and blue tiled walls. We noticed the color trends of rich plums and purples lavenders and aubergine. We fingered fine plaids, discussed the textures of cotton crepes, and noted that back belts and harem pants were making a return. 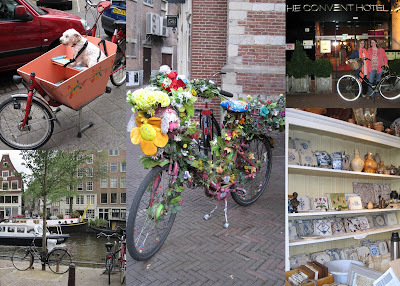 We enjoyed watching the tall blond Dutch women riding their tall bicycles and noticed the dog in a pretty bike cart. We dined with my cousin, and his son and his girl and felt that at the end of the day there was no more to be done. Off to Delhi we said - another cool spot - off to Delhi, cause it's really hot! Here's to designing and travelling and women with style! Feel Beautiful, Be Beautiful, Live Beautiful! Awesome. Felt as if I were there from such detailed visuals..wishing I actually was! Could your job be any more of a dream? Next time, you must try the Rice Pudding pie that I had in Holland [I'm sure they carry it along the Netherlands] in petite cafes. The dog in cart was classic -the colors and theme was so approp, a la April, lol sooo cute!